What is Migraine Support Formula? Our Migraine Support Formula review will give you all the information you will need about this particular medication. It aims to provide a quick acting relief for migraines, as well as stifle the common triggers to this condition. It also contains a list of clinically proven ingredients to help stop migraines from triggering. If you wish to learn more, please read our in-depth review below. Each ingredient included in the development of this medication contributes in specific ways to not only help treat migraines, but also strengthen the body to prevent future attacks from happening. You can take this medication if you are experiencing a bout of a migraine attack or as a daily dietary supplement to help prevent migraines from developing. As a supplement, take 4 capsules per day preferably 2 times after a meal. For your safety please keep in mind that pregnant women, children under the age of 18 and individuals who currently undergoing medical treatment should first consult their doctor before taking this supplement. One bottle of Migraine Support Formula contains about 120 capsules, a month’s supply if the instructions for the dosage are followed. It is currently priced at around $63 per bottle. The official website does offer a 3 month supply package which is given with a discount and is available at $129 retail price. This item also includes a free Migraine Treatment Myths Revealed book but is a limited offer. This product contains magnesium which is known to trigger diarrhea and other digestive tract problems. To prevent this from happening, make sure that you contact your doctor first before trying out any new medication or dietary supplements. The official website offers this dietary supplement with a generous one-year money back guarantee. If you find that this product does not meet your satisfaction or does not give you the results you hope for then you can return it and get a full refund. 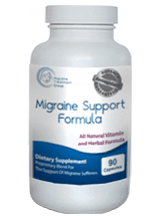 The Migraine Support Formula might just be a good dietary supplement choice for those who are often suffering from migraines. It is fast acting and the nice guarantee removes almost all risks. However, this product is quite expensive and the lack of actual outside customer reviews is a bit worrisome about the quality of this product.